ENT Surgery illustrations for print or online use. Board certified medical illustrator Dr Levent Efe is renowned for his work in Surgical art, covering many disciplines in Surgery. He has had extensive experience in illustrating techniques by prominent ENT surgeons in Australia and world wide. Dr Levent Efe regularly contributes to several surgical textbooks and peer reviewed journals in Australia and world wide. 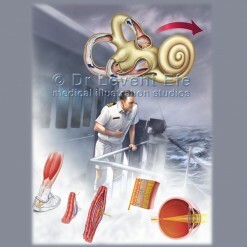 ENT illustrations – for online or print publication.